We all have some sort of grooming routine. Brush teeth, shower, shave, moisturize, apply sunscreen, spray cologne, repeat daily. Sound familiar? Whatever habits you have, there’s a good chance you either get lazy some days and skip certain things or you’re just doing something wrong. I mean, who can remember everything? I was asked to contribute to a story Men’s Health magazine was working on about grooming failures and naturally I discussed what I considered our top fragrance faux pas. To see how you can improve your routine and my thoughts on this topic, read the story on their website. Feel free to let me know what you think about the list, mine included. 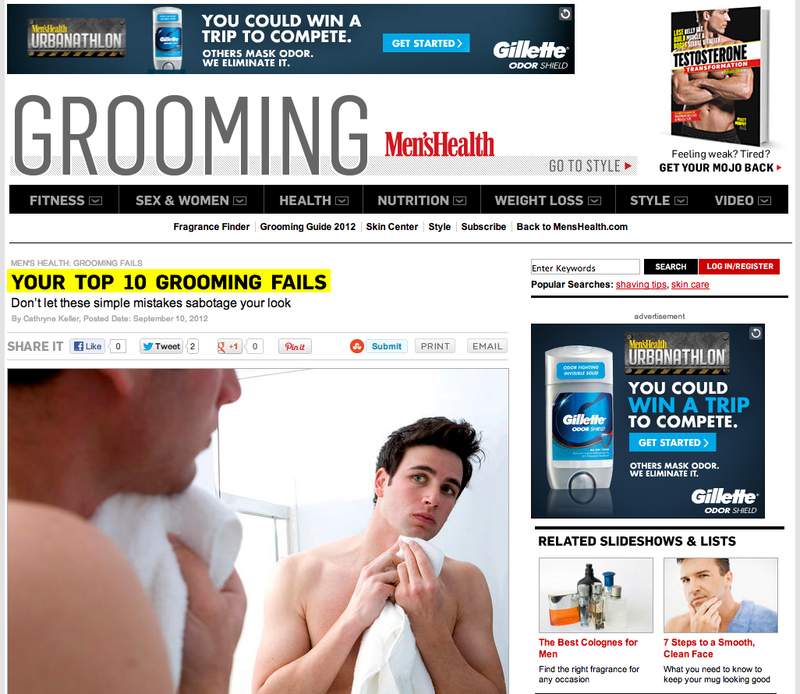 This entry was posted in Good Read and tagged How to apply cologne, men's cologne, Men's Fragrances, Men's grooming, Men's Health Magazine, Shaving. Bookmark the permalink. Nice piece about the dreaded overspray. I will tell you what my biggest grooming fail.. using a glycolic cleanser on my Clarisonic. My face was red, irritated and in pain for the next day or so. Thanks Ron. As for the Clarisonic episode, ouch. Other than that, how is? Which one do you have?